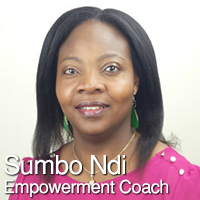 Sumbo Ndi is on a mission to inspire, motivate and empower others to achieve success and improve performance. As a young girl, Sumbo believed that if you put your whole heart into something, believed you could achieve it, and if you were willing to take laser focus action, then you could attain your goals. She is now an empowerment coach who has developed her own coaching model “Clarify to Succeed” to help others achieve their goals. Sumbo coaches people and organizations from all over the world including Australia, China, Hong Kong, Kenya, Singapore, Egypt and Greece! (0:36) Sumbo graduated from ICA and enrolled in the Learning Leader course. (1:00) She is an empowerment coach who works with women. (1:13) She partners with women who are ready to step up. (1:20) Submo offers co-creative partnership to achievement. (1:48) She asked herself if there was more that she could do? Answer was coaching. (2:01) Enjoys empowering and encouraging others. (2:22) As a scientist, Sumbo looks to create a system or process for others. (2:47) Her system starts with ‘What do I want to achieve?’. (3:18) Sumbo dreamed about her coaching practice. Literally. (3:53) She enrolls in ICA and was impressed with the graduates she meets online. (4:47) She believes in “Take action or nothing happens”. (5:02) Her coaching model was Clarify to Succeed. (6:58) YES! is the shout you want at the end of the coaching process. (7:27) She believes in celebrating milestones along the way to success. (8:20) Her Power Tool was: Clarity vs Ambiguity. 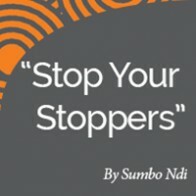 (8:53) Sumbo’s research paper on Stopping your Stoppers; is about overcoming obstacles. Merci: Hi, I’m Merci Miglino, and welcome to Day in a Life of a Coach. Today I’m talking with Sumbo Ndi in Adelaide, Australia. Welcome Sumbo. Merci: So Sumbo is a graduate of International Coach Academy in 2013, and she’s also currently in our learning leader course which is all about taking that coach approach into group work or training, or presenting. And it’s been a delight to have you there. Merci: So let’s see now. 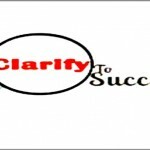 Clarify to Succeed is your coaching business. And you are an empowerment coach. Merci: So tell me a little bit about who you work with. Sumbo: I work with women who are at the stage of taking the next step in their lives, whether it is in their personal lives or in their career. Because with the help of a coach, she can get all the confident, the strategies and the partnership and the co-creation that can happen with the help of a coach. Actually take that move into the next stage of what they want to achieve. Merci: Yeah, wow, sounds great. How did you come to coaching? Sumbo: Well, coaching, before I actually took the step to enroll and go through the training, I’ve had a lot of thinking about, for few years because I go to a point where I started thinking, you know, about, you know, is there more that I can do? I like, you know, talking to people, encouraging people and mentoring. And I was just beginning to think that I always enjoy that time of encouraging someone, imparting someone, I feel really in my zone, if you know what I mean? Merci: Well, wow, that’s amazing. Sumbo: So I started researching about how can you do this, how can you do this? So one day, I stumbled on the website of a guy who apparently was a graduate of ICA. And I saw what he was doing and I go, “That was it, that’s exactly what I want to do.” So I followed the link in that site to ICA. Because in that time I’ve been researching different, you know, coach training institutions. And I was so confused as to which it where you’re going even start. But you know, seeing this guy’s website, just you know, give me that – yeah, that was it. And then I went – I see a website, I look at everything, so what other graduates have done. So I thought, “Yeah, that’s the place.” So I thought to myself last year, I said, “This is the year for my coach training.” And I actually took the step to do that. Because as you know, if you don’t take action in the direction of our dream, nothing happens, yeah. Merci: …we’re going to talk a little bit more about more about what your work at ICA. 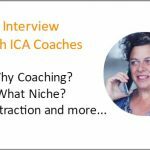 First thing, tell me a little bit about your coaching model, like we here at ICA create our own coaching model. So tell me what yours was. Merci: Yes, [laughing] I love it. Yeah. Sumbo: [laughing] Yeah, you got to celebrate, you know, also we encourage people celebrate little milestones along the way. And then getting into that point of “Yes,” you can look at everything, “Okay, is this what I really wanted to achieve? Did I achieve it or what happen upon along the way? Maybe I didn’t really hit the target.” It’s not so much really about the destination. Sumbo: It’s also about the whole journey. It’s good to have ahead in mind, however, also to remain flexible along the way knowing that things could change. You could go through a different route, but as long as you get the outcome that fulfills you, that means something to you. So that is the goal of what I do. Merci: Clarified. Wonderfully done. Sounds very powerful. Speaking of powerful, what was your power tool? Here at ICA, we create our own coaching tools, what was yours? 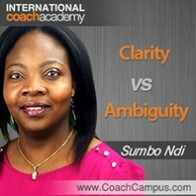 Sumbo: That was clarity versus ambiguity. Merci: Oh, of course, clarity versus ambiguity. 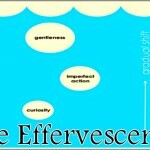 Merci: So you kind of overlap some of your coaching model with your power tools so they kind of work together? Merci: Great. Good job. Let’s see. The other one is the research paper. What was your research paper about? Sumbo: Yeah, that was thought leadership article, “Where would I stop, stopping, your stop has?” Identifying roadblocks in the way of your success and living to your full potential because understanding that in order for us to achieve success, or whatever we set out to, there’re often some roadblocks that we need to be aware of and also develop strategies to help, you know, client from the perspective of a coach, we need to have that understanding that those roadblocks and when those things come up during the coaching process, we are more aware and we are able to deal with those roadblocks. So that our clients can move forward. And also on personal level, we need to be aware of that on our own journey, too, knowing that these roadblocks are there and be aware of them and deal with them when they surface so that we can move forward. Merci: Right. Right. Oh, my gosh, very powerful packing of tools there. Good for you. Merci: …about coaching, what would it be? Sumbo: Well, I think coaching is really empowering because in achieving success, we don’t need to do the journey alone, with leveraging on the help that we can get through coaching and actually getting to the deep root of some of the issues that we have in some of the roadblocks that I talked about. It’s quite powerful with coaching. What you can achieve maybe in twelve months, with the right coach, and with the right support, things can up on the shortest amount of time that, you know, it’s quite possible and I would encourage anyone, you know, to get a coach, get a mentor, leverage on the people’s experiences. Leverage on the support that you can get so that you can get the way you want go. Merci: …do you have a website? Would you tell us for all our viewers out there? What’s your website? Sumbo: Yes, I do have a website and that is clarifytosucceed.com. Merci: Right. So if you want to know more about Sumbo’s coaching approach and her model and her extensive, wow, such an incredible passion for coaching here. So thanks again for being my guest on Day in the Life of a Coach. Thank you, Sumbo. Merci: Thank you very much, Merci. 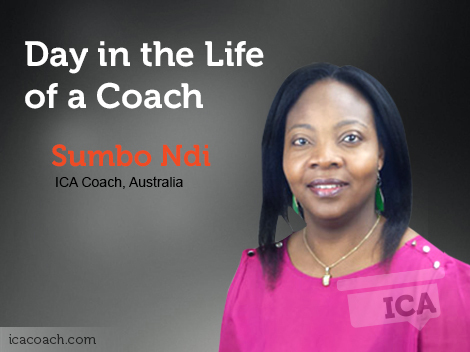 Sumbo Ndi, has a Ph.D in Biomedical Science and has earned the Accredited Certified Coach credential (ACC) from ICF.